Sigizmund Krzhizhanovsky. 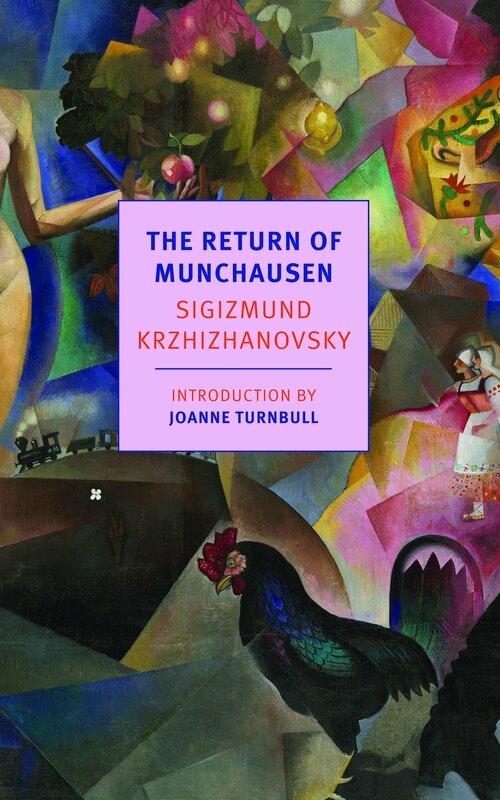 The Return of Munchausen, translated from the Russian by Joanne Turnbull with Nikolai Formozov. Riding a giant clock, the famous wanderer Baron Munchausen crashes forward through time, like Doctor Who, into 1920s Paris. Two centuries adrift from his 18th-century origins, he proceeds to visit London, Berlin and Moscow, before heading back to his country estate in Bodenwerder. Book cover. Source: NYRB ClassicsIn The Return of Munchausen (translated by Joanne Turnbull; New York Review Books Classics, Dec. 2016), modernist writer Sigizmund Krzhizhanovsky resurrected the baron so he could show, in his surreal satirical version of Soviet Russia, the cruel absurdity of life under Bolshevik rule. Censorship prevented these philosophical fantasies being published until 1989, seven decades after they were written. An impoverished German geologist called Rudolf Raspe wrote the first Munchausen stories. The real Baron Hieronymus von Münchhausen, an eccentric nobleman, may have fuelled them with his exaggerated tales of diplomatic and military adventures. But the fictional baron took on a life of his own and subsequent writers embellished his escapades still further. At the heart of Krzhizhanovsky’s novella is an episode called “Devil in a Droshky”, an account of Munchausen’s Russian experiences, delivered as a lecture to the Royal Society in London. His talk is illustrated, as if it were an avant-garde Power Point presentation, with images thrown onto a flat screen by a magic lantern. Munchausen travels, like a speedy Gulliver, through “the land of the Soviets”, offering advice to what he later calls “the country about which one cannot lie.” He solves a horse shortage by cutting the animals in half, gets a group of brigands to blow out the moon, and hires pipers to lure rats into soup kitchens to provide food. The book’s most pervasive images are clouds and smog of various kinds, including the misty atmosphere on the city streets. Prefiguring Tolkein’s wizard Gandalf Munchausen can blow extraordinary shapes from his pipe: “swirling dove-coloured spheroids” with “slow smoky coils” like Saturn’s rings around them. A Russian steam train runs on burning books and windmills loom out of the morning fog. Award-winning translators Joanne Turnbull and Nikolai Formozov have skillfully translated this rich, fanciful text and other books by Krzhizhanovsky. The baron’s name is synonymous with fantasy and tall stories, but – ultimately – the monstrous reality of Soviet Russia can “out-Munchausen Munchausen.” Some of his most outlandish claims (like becoming a “conditional corpse”) have their roots in fact. He compares his time in Russia to a nightmarish game of chess, in which an “indestructible red queen” empties all his squares. Through Munchausen’s absurdist logic, Krzhizhanovsky argues that his metaphors represent a deeper truth than the concrete examples of Science. The same logic dictates the 200-year-old baron’s anarchic approach to the passage of time. When a mathematician warns him he’s due to meet the king in an hour, Munchausen replies: “One hour is three thousand six hundred tick-tocks on the part of a pendulum clock”.